The umbilical cord of my omphalos winds its way back in time to the blessings of my mother and father, but also inwards and outside-of-time, stretching into a womb land that is all myth and dream and imagination. With some effort I can follow my way back into this makom, this space and hopefully return from it with something useful — or at least, interesting — and not just to myself mind you. I do love sharing these thoughts, but I am also interested in their relevance, by which I mean, their utility. Let me explain. The verdict of the spectator is separate from the activity of the artist. The spectator might very well take umbrage if the art object, the object of fascination (or boredom) had been or had not been toiled over, had or had not been the expression of a theory or movement, had or had not been the work of an artist at all. As a spectator, my verdict is not whether art is or is not art, but whether the art is useful — and useful only in the sense of whether it has opened my eyes and expanded my conscious awareness as to the existence of wonder in the world of relationships and things outside of frames and pedestals, galleries and museums — whether appreciation of the art object has brought me to appreciate everything else in the Everything Else room in the Everything in the Whole Wide World Museum. In a related sense, as much as I ponder myth in Judaism specifically, and religion in general, I return to this concern, that these ideas, while interesting to me, while stimulating and enriching an emerging creative expressive innerverse within me, that these ideas should also hopefully be useful for others. That if they are not, that they are trivial, and that this whole project is a delusion of self-indulgence. I will be honest with you, that I am not wholly convinced that this is not, but I am writing — with the intention that these labyrinth of ideas I’m exploring and sometimes getting lost in — that I will bring back along my wayfinding thread/trail of breadcrumbs/umbilical chord, something useful. I’m hopeful that just as art becomes useful by revealing to an observer the greater wondrous reality outside the frame of (framed) Art, that my insights into myth and religion might also be useful for helping to reveal a greater wondrous imaginary world only hinted at within the source text of religious doctrine and dogma. Myth and storytelling thus convey the promise and potential of enduring creative liberty and the subversion of religious control to generations of eager children and aging heresiarchs. Having said this, let me share with you something totally weird that I just found (on wikipedia, where else) that blew my mind. An Arabian myth of a creature called Bahamut (بهموت) which unlike the Behemot is not terrestrial, but like Leviatan, inhabits the endless depths of the ocean. This is mind blowing to me because the tradition in Sefer Ḥanokh, that the Leviatan is the mate of the Behemot seems much more plausible (in a sort-of mythic taxonomy) if we imagine both of them as sea dwellers rather than as opposites on a terrestrial/aquatic scale. 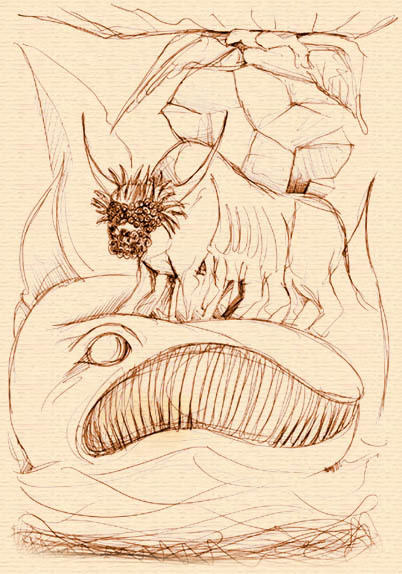 Just for review, I’ve written about the Behemot in Jewish myth, how it seems to relate to Apsu, the ancient ur-deity in Babylonian mythology, the personification of heavenly fresh water. I’ve written how the Behemot is imagined as a cosmically large hippopatamus dripping with condensation, and referred to in midrash as the “Ox of the Pit.” I’ve wondered whether the Pit was a reference to the t’hom, the primordial abyss, the abstraction of the other Babylonian ur-deity and personification of saltwater, Tiamat. How Leviatan seems to be synonymous with Tiamat in biblical writings. How Behemot/Leviatan are mated to one another in Sefer Ḥanokh. The Talmud also prefers the notion that Leviathan and Behemot were each created like all other creatures, male and female. So the existence of a myth where Behemot takes the form of a non-terrestrial sea creature like the leviathan seems significant. Bahamut (Arabic: بهموت, Bahamūt) is a vast fish that supports the earth in Arabian mythology. In some sources, Bahamut is described as having a head resembling a hippopotamus or elephant. If that’s not enough of a teaser, here is the entire fantastic entry on Bahamut written by Jorge Luis Borges in his Book of Imaginary Beings (translated by Margarita Guerrero, Norman Thomas di Giovanni) . I want to point out that I find it significant that similar to the Behemot tradition, the Bahamut myth describes the creatures with hippopotamus features. Behemoth’s fame reached the wastes of Arabia, where men altered and magnified its image. From a hippopotamus or elephant they turned it into a fish afloat in a fathomless sea; on the fish they placed a bull, and on the bull a ruby mountain, and on the mountain an angel, and over the angel six hells, and over these hells the earth, and over the earth seven heavens. A Moslem tradition runs: God made the earth, but the earth had no base and so under the earth he made an angel. But the angel had no base and so under the angel’s feet he made a crag of ruby. But the crag had no base and so under the crag he made a bull endowed with four thousand eyes, ears, nostrils, mouths, tongues, and feet. But the bull had no base and so under the bull he made a fish named Bahamut, and under the fish he put water, and under the water he put darkness, and beyond this men’s knowledge does not reach. Others have it that the earth has its foundation on the water; the water, on the crag; the crag, on the bull’s forehead; the bull, on a bed of sand; the sand, on Bahamut; Bahamut, on a stifling wind; the stifling wind on a mist. What lies under the mist is unknown. So immense and dazzling is Bahamut that the eyes of man cannot bear its sight. All the seas of the world, placed in one of the fish’s nostrils, would be like a mustard seed laid in the desert. In the 496th night of the Arabian Nights we are told that it was given to Isa (Jesus) to behold Bahamut and that, this mercy granted, Isa fell to the ground in a faint, and three days and their nights passed before he recovered his senses. The tale goes on that beneath the measureless fish is a sea; and beneath the sea, a chasm of air; and beneath the air, fire; and beneath the fire, a serpent named Falak in whose mouth are the six hells. The idea of the crag resting on the bull, and the bull on Bahamut, and Bahamut on anything else, seems to be an illustration of the cosmological proof of the existence of God. This proof argues that every cause requires a prior cause, and so, in order to avoid proceeding into infinity, a first cause is necessary. The story of Bahamut is thus a variation in a wide tradition of cosmic creatures said to be supporting the world. In Hinduism, the creature is Akupara, a ginormous tortoise. Or elsewhere in the Vedas, as the turtle being Kurma, second incarnation of Vishnu. 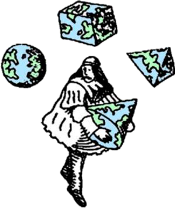 In Greek myth, it is the titan, Atlas. If you’ve read any Terry Pratchett, you might also be reminded of the turtle that supports his fictional Discworld. Men are making speeches…all over the country, but each expresses only the thought, or the want of thought, of the multitude. No man stands on truth. They are merely banded together as usual, one leaning on another and all together on nothing; as the Hindoos made the world rest on an elephant, and the elephant on a tortoise, and had nothing to put under the tortoise. If anyone be asked what is the subject wherein colour or weight inheres, he would have nothing to say but, the solid extended parts; and if he were demanded what is it that solidity and extension adhere in, he would not be in a much better case than the Indian before-mentioned who, saying that the world was supported by a great elephant, was asked what the elephant rested on, to which his answer was, a great tortoise; but being again pressed to know what gave support to the broad backed tortoise, replied, something, he knew not what. Perhaps the Indian said, “Bahamut.” Bahamut, the imaginary foundation of the world of myth. Illustration of Bahamut for The Book of Imaginary Beings by the graduate students in the Department of Illustration and Art of the Book at the Vakalo School of Art and Design in Athens, Greece. 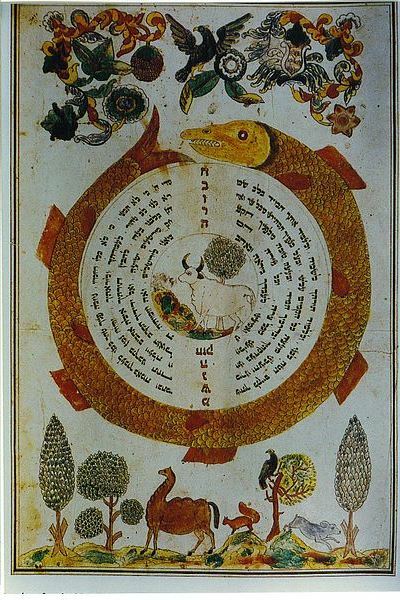 Illuminated page from the pinkas (“minutes”) books of the Mishnah Society of the Apter Rov’s kloyz, Medzhybizh, circa 1840. “Behemot and Bahamut” is shared by Aharon N. Varady with a Creative Commons Attribution-ShareAlike 4.0 International copyleft license. Facinating/marvelous! Recall also, the Babylonian depiction of the astrological sign we now call “Cancer” with, not a crab, but a snapping turtle, the word in Babylonian “MUL.AL.LUL” meaning either one, but a stark absence of crab imagery on old Babylonian art, as opposed to the turtle who is oft represented. This turtle is identified, like the crab-cancer is later Greco-Roman astrology, with the entrance to the underworld, carrying on our defintion here of Bahamut at the summit between being and non being. Cancer is located right near the mouth of Draco, the water serpent, of course. Her Egyptian name is Scarab, with similar implications. Nice work!